Lucas Todd still felt like his mind was being blown. He’d just been accepted into UCLA’s Astronomy and Astrophysics graduate program. Ever since his Dad told him about watching Neil Armstrong setting foot on the Moon on television, he wanted to go there, too. NASA’s manned space program had gotten pretty disappointing since then. His Dad always thought he’d see a permanent Lunar Base or maybe even a colony being established during his lifetime, but poor Dad died of cancer last year. Lucas didn’t want Dad’s dreams to die with him. He was standing in the middle of what looked like a giant hologram of the inner Solar System. The man who called himself “the Almighty” wasn’t particularly impressive. Morgan Freeman had played God in the movie Bruce Almighty, but this guy looked more like the weatherman on the evening news. The Almighty magnified a small section of the 3D image and Lucas could see a tiny Earth being approached by an even smaller object. The image expanded again as the object (only the Almighty knew its real name) moved closer to Lucas’ home planet and as the seconds passed, he realized that it was not a close flyby. “Wait! It’s going to…” He watched in horror as the six-mile across asteroid impacted in what would one day become the Gulf of Mexico. “So this is Heaven. Literally, I’m standing in the heavens.” The young student waved his arms across the expanse of the Solar System around him. He followed the Almighty as the scene shifted and then they were looking at Mars, but it wasn’t the Mars Lucas knew. He’d been enjoying the experience up until that point, but now he remembered how much he missed his Dad. He wished Dad had lived long enough to see him get his doctorate. “What then?” Lucas was yelling now. Impulsively, he decided to run all over the inner Solar System. He even tried to give Venus a good push into the Sun but his hand went right through the projection. “There always is with you.” Lucas had read and studied the Bible when he was younger trying to figure out a way to reconcile the beliefs of his parents. It seemed to him that God liked to play games with humans. Obey the Torah completely? Can’t ever obey Torah completely. Jesus died and rose and promised to return? Two-thousand years later, no Jesus and the world is still a mess. “I wouldn’t miss it for the world.” He straightened up and God saw a big smile on the young man’s face. Lucas had a dream. 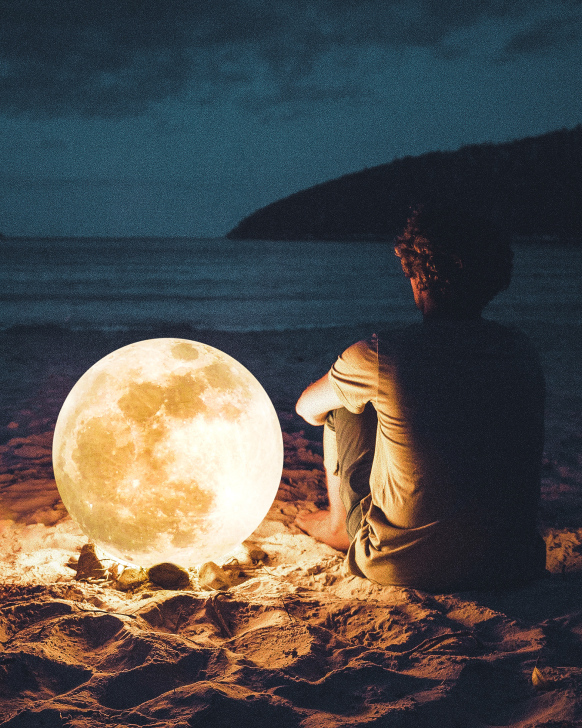 In that dream, he was sitting on a beach looking out over the ocean, but instead of the Moon rising in the east, it was sitting right next to him. He could see everything there was to see about it, past, present, and future. The Moon had yet to be created, the Moon was being created, the Moon was progressing forward in time from the earliest prehistory, across human history, and then beyond. When he looked closely at the northern rim of Peary crater, close to the north pole, he could see construction crews in spacesuits finishing Phase One. I wrote this for the Photo Challenge #200 hosted at Mindlovemisery’s Menagerie. The idea is to use the image above as the inspiration for crafting a poem, short story, or other creative work. I’ve always imagined that God would experience the entire history of the universe from creation to ultimate conclusion as a single event. If we could see that, it would be a sort of hologram of immense complexity. Since people are designed to perceive time in a linear fashion, God would have to pick out specific details to show us, such as an asteroid hitting Earth 65 million years ago, or witnessing oceans on Mars three-and-a-half billion years ago. I don’t believe that faith and science are mutually exclusive either, but it’s hard to explain to those who are dogmatically dedicated to one over the other. Oh, I am a Christian (albeit a highly unusual one) and my wife is Jewish, so our children can attest to how confusing it can be growing up in an interfaith family. I love this exchange. As a Christian ” don’t believe that faith and science are mutually exclusive either.” In fact, it makes my faith stronger.